The flat anterolateral abdominal wall is created by the abdominal muscles’ four distinguished pairs. These muscles look like layers of tissue- they are flat but could be straight when contracting. The abdominal wall consists of 4 parts namely: internal abdominal oblique, external abdominal oblique, rectus abdominis and the transversus abdominis. Basically, the abdominal muscles function as the abdominal cavity’s structural support and the internal organ’s protection (particularly those within the abdominal cavity) as well. It also functions as an aid in respiration. The contraction of muscles within the abdominal wall aids a person in performing heavy duty tasks such as carrying objects with heavy weight by providing protection and stability to the spine. Such contraction is also an aid during the bowel movement. For women who will bear a child, the contraction in the abdominal wall muscles helps a lot to make the childbirth possible. Most people might not notice it, but most of the daily activities were made possible because of the contraction of these muscles. The external abdominal oblique, although considered to be the most superficial part of the abdominal wall, is the strongest part. The fibers of the muscles in this part of the abdominal wall is intended for strong contractions. Situated deep under (yet at right angles with each other) the external abdominal oblique is the internal abdominal oblique muscle. This two muscles could make up a strong unison with each other, making it the most structural and functional part of the abdominal wall. 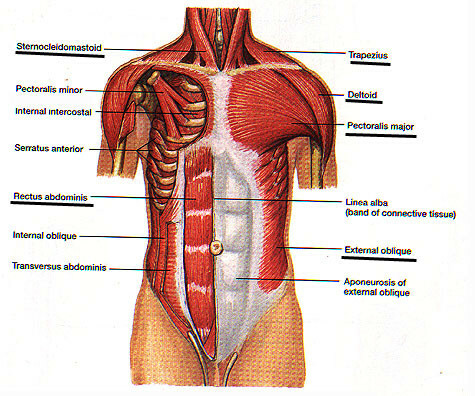 The transversus abdominis is the muscle of the abdomen that is located in the deepest part. Its fibers are long, and is laterally across the wall of the abdomen. The long rectus abdominis is enveloped with a large covering. Its fiber is similar to a strap, and is protected with a fibrous covering which comes from the fibers of the abdominal wall’s three other muscles. There’s also a part in the abdominal wall named the linea alba- it is a connective tissue that separates the 2 rectus abdominins muscles. It runs in the abdominal wall’s middle part. Many people might wonder why there is an appearance of “abs”. It is because of the tendons which horizontally trasverse the abdomen. This is for the people having a good abdominal muscle tone, and low body fat in the area.